Woo hoo! I won one of these four books from Scraptime. 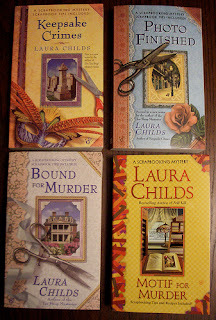 It a scrapbook mystery by Laura Childs. I am so excited!!! Thanks to Christine and be sure to check out her webcasts at Scraptime. They are awesome!! !